Most of all being financially literate empowers a person to make their own economic decisions, be it on investment, saving or budgeting, ultimately allowing them to take charge of their life. Financial education must start at an early age and preferably before one goes off to work in the real world. This is because money needs to be managed regardless of an individual’s occupation or socioeconomic background. Beside at home and in schools, a university is an important ground for the financial education framework to grow as it is crucial to empower students that will soon enter the workforce on sound financial investment and management. As a home-grown professional body, Malaysian Financial Planning Council (MFPC) had taken the initiative in promoting awareness on values and importance of financial planning to the population at large, and in particular, to our undergraduates, by holding the 1st Financial Planning Quiz in collaboration with University Utara Malaysia (UUM) Sintok, Kedah on 1st and 2nd July 2013. 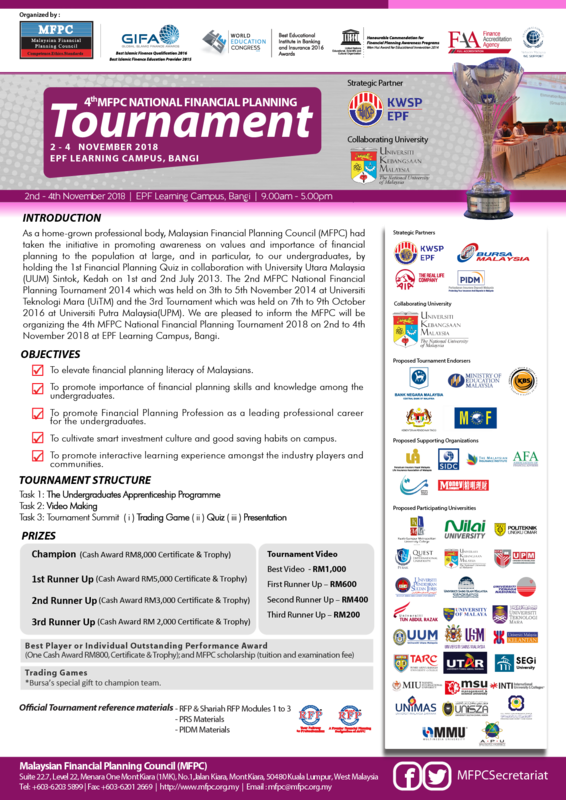 The 2nd MFPC National Financial Planning Tournament 2014 which was held on 3th to 5th November 2014 at Universiti Teknologi Mara (UiTM) and the 3rd Tournament which was held on 7th to 9th October 2016 at Universiti Putra Malaysia(UPM). 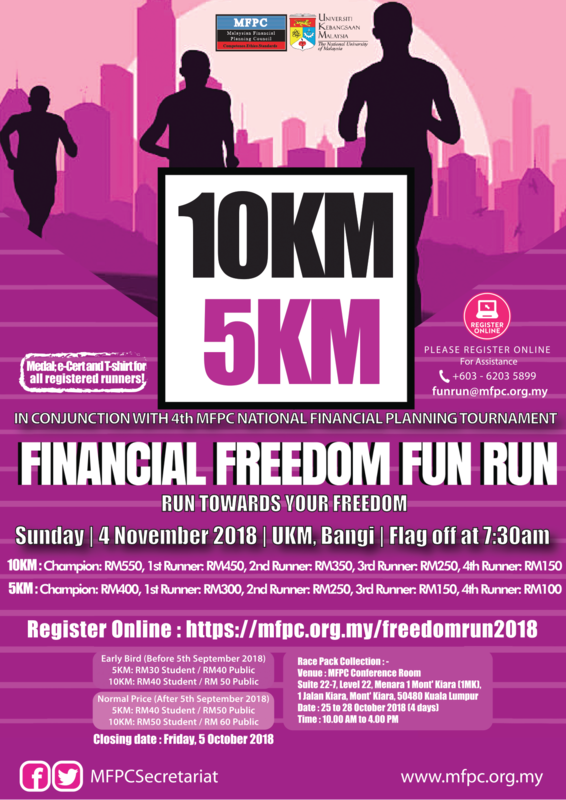 We are pleased to inform the MFPC will be organizing the 4th MFPC National Financial Planning Tournament 2018 on 2nd to 4th November 2018 at EPF Learning Campus, Bangi. 1. To elevate financial planning literacy of Malaysian. 2. To promote importance of financial planning skills and knowledge among the undergraduates. 3. To promote Financial Planning Profession as a leading professional career for the undergraduates. 4. To cultivate smart investment culture and good saving habits on campus. 5. To promote interactive learning experience amongst the industry players and communities.